The obverse depicted a wreath of ears of corn and roses in his right side and laurel branches and roses on the left, tied with a ribbon in the middle. 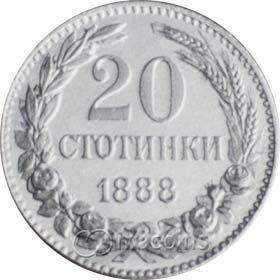 In the center of the coin is the nominal value of 20 stotinki and below her is the year of issue - 1888. The reverse side depicted small Bulgaria coat of arms. In the outer circle of the coin has an inscription “Unity renders power” and “Bulgaria”. Related links to "20 stotinki"